I was in Mazatlan last week–yes, New Year’s in Mexico! It was a wonderful time away with very good friends. A much needed break for Hubs and I after a busy year and chaotic–sick–lead up to and through Christmas. We stayed at the Riu Emerald Bay. A lovely resort, popular with families (which, for the four of us mature adults seeking time away from responsibilities proved not the best choice when one is trying to escape screaming kids (friend is a Kindergarten teacher) and just relax without adrenaline bursts whenever a toddler toddled to close to a pool (me), but that’s another post). This post is about the cart the resort has near the pools offering free-read novels and magazines. Give one, take one. 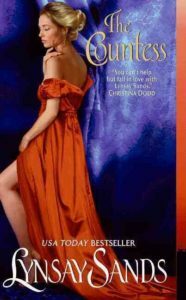 I took Lynsay Sands’s, The Countess, and read it in a day. Full of dark humor and a mix-up between identical twins (one nasty, one the hero) with a game of hide the corpse thrown in, the story also touches on more serious matters, like the impact of emotional and verbal abuse. I initially struggled with the heroine’s quick trip to passion with the man she believes her abusive husband (it was his kinder twin), but I’m glad to say Lyndsay Sands skillfully handled the subject, and crafted in a way I was able to forget my personal foibles and invest in the relationship outcome. If you’re looking for a humorous take on a difficult subject, and of course romance and a HEA, I recommend The Countess, by Lynsay Sands. If you read it, or have read it, please come back and share your thoughts!